Ginger Cookies are aptly named, as they are both ginger colored and ginger flavored. They have a sugar coated crackly surface, and when you bite into one you will find the texture soft and chewy with a flavor that is buttery and spicy. The combination of molasses with ground cinnamon, ground ginger, and cloves makes eating one just about impossible. 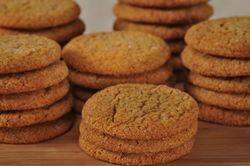 Gingersnaps, Molasses, and Gingerbread Cookies all belong to the same group as Ginger Cookies. Although I think these Ginger Cookies have just the right amount of ginger flavor, especially for kids, adults may want an extra punch of ginger. This can be done by adding finely chopped crystallized ginger. Just add it to the batter along with the flour. And before I forget, keep in mind that ground spices have a fairly short shelf life so it is best to buy in small quantities from a bulk food store that has a high turnover. The added advantage of buying them in bulk form is that they are a lot cheaper than buying those small glass bottles from your local grocery store. Make sure to store your spices in a cool dry place, away from heat (it is not a good idea to store them by the stove). Finally, there are two types of molasses generally used in baking; light and dark. While I have used light molasses in this recipe, if you want a cookie with a more robust flavor, try using dark molasses. Light molasses comes from the first boiling of the sugar syrup and is lighter in flavor and color than the dark molasses which comes from the second boiling. Molasses is usually labeled as "sulphured" or "unsulphured" depending on whether sulphur was used in the processing. I prefer the unsulphured molasses which is lighter in color and tends to have a nicer flavor. By the way, molasses is used in baked goods, not only for flavor, but also for color and moistness. It is a good idea to lightly spray your measuring cup with a nonstick vegetable spray before pouring in the molasses. This prevents the molasses from sticking to the cup. This recipes is adapted from Canadian Susan Mendelson's enjoyable cookbook called The Lazy Gourmet. Ginger Cookies: In the bowl of your electric mixer (or with a hand mixer), beat the butter and sugar until light and fluffy (about 2 - 3 minutes). Add the molasses, egg whites, and vanilla extract and beat until incorporated. In a separate bowl whisk together the flour, baking soda, salt, and spices. Add the flour mixture to the butter mixture and mix until well combined. Cover the batter with plastic wrap and chill in the refrigerator for at least an hour, or until firm. Preheat your oven to 350 degrees F (180 degrees C). Line two baking sheets with parchment paper. Place about 1 cup (200 grams) of granulated white sugar in a medium sized bowl. When the batter has chilled sufficiently, roll into 1 inch (2.5 cm) (15 grams) balls. Then roll the cookie balls into the sugar, coating them thoroughly. Place on your baking sheet, spacing about 2 inches (5 cm) apart. Then, with the bottom of a glass, gently flatten the cookies slightly. Bake for about 8 - 10 minutes or until the cookies are firm around the edges but are still a little soft in the centers. (The longer the cookies bake, the more crisp they will be.) Cool on a wire rack. Cover and store in an airtight container for several days or they can be frozen.